My turn on the MQG blog! 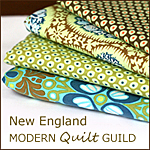 I was the guest contributor on the Modern Quilt Guild blog today. Check it out if you have a moment! 3/4 length sleeves, buttons all the way down the front, red floral fabric, and a bright red cummerbund. During the process of looking at what I’m sure was every single 50s and early 60s shirtdress pattern out there, I learned a great deal about the garment itself, which I would love to share with all of you. I stumbled upon an article called “Tracing the Path of the 1950s Shirtwaist Dress” by Heather Vaughan on the in the online journal Clothesline, which led me to the website of Costume Institute at the Met (go check it out–you could spend hours printing inspiration photos here). Stay with me, y’all. I was an American studies major, after all, and I really enjoyed this foray into the world of the shirtwaist–I hope you will, too. Vaughan’s basic thesis is this: “The shirtwaist itself encompasses the 1950s ideal of conformity and domesticity and a variety of media reinforced these notions over time.” She argues that magazines played the most significant role in perpetuating these ideals. Eek. Now, I don’t need to be told that fashion and cultural ideals were tightly interwoven during that period (see Gertie’s post about the housedress), but I admit to being surprised about how much the ideal of the “perfect woman” was connected to the shirtwaist dress, one of my favorite silhouettes of all time (boo hoo). Vaughan notes that The Woman’s Institute of Domestic Arts and Sciences called the shirtwaist dress “a simple, practical dress” that, “because of its trim simplicity and graceful dignity,” it had advantages in both the classroom and business (I know it’s disturbing how much this highlights the limited range of jobs available to women during the era, but let’s move on). Before you get offended (or just confused) by the name The Woman’s Institute of Domestic Arts and Sciences, I’ll pause for a brief history of the organization. It was founded by Mary Brooks Picken (1886-1981), who was considered an authority on textiles, sewing, and needlecrafts for decades. She published ninety-six books on a range of subjects (fashion, tailoring, patternmaking, millinery, etc.) between 1915 and 1957. She taught the economics of fashion at Columbia, was one of the five founding members of the Costume Institute at the Met, and was the first trustee of FIT. In short, she is awesome. Again, moving on. The 1950s style shirtwaist (or the shirtwaist silhouette as I know it) was popularized by Christian Dior beginning in the late 40s. His “New Look” collection in 1947, according to Vaughan, “almost single-handedly defined the post-war silhouette.” Dior focused on the “nipped-in” waist and a full (often very) full skirt. The single dress widely recognized as the catalyst for the shirtwaist’s overwhelming popularity is called Cherie and is, luckily, on display at the Met and on the Costume Institute’s website. Nancy White was the fashion director of Good Housekeeping in 1947 when Dior released his “New Look” collection. White followed the trends “from a distance,” according to Vaughan, and reported on them in a manner that was colored by the practicality for which the magazine was known. Good Housekeeping criticized the high price points of Dior and similar designers, but embraced the silhouette of the style and the values embodied therein. The essential components of Dior’s shirtwaist were all found in GH in the late 40s and early 50s, including the pleats and “wasp” waist. Posture was also highly emphasized during this period, and GH encouraged its readers to do the following: “When you stand and walk, consciously tuck your buttocks under as if you were flinching from a spank.” I wonder how many 50s housewives were so accustomed to being spanked that they could incorporate it easily into their everyday movements…but I digress. Throughout the mid- to late fifties, the concept of the dress as cultural icon was reinforced through popular television characters on shows like Leave it to Beaver, The Adventures of Ozzie and Harriet, and The Donna Reed Show. Troublingly, Vaughan notes that Donna Reed’s “character and unrealistic perfection helped to solidify the shirtwaist dress as an icon of female perfection.” By the mid-sixties, however, the shirtwaist dress had disappeared in favor of boxier, straighter silhouettes. Vaughan’s article, though excellent, does not delve into detail about the different types of shirtwaist, a topic I will pick up on another day as I continue to share my quest for the perfect shirtwaist dress pattern. Stay tuned for part two of my miniseries! I used the main pieces of Butterick 5177, which is actually a dress pattern. I just used the top section of the three basic pattern pieces (front and backs) and modified the rest. I’m very happy with it. I know I look sad, but I had just woken up and the light was good, so I had to run outside with my camera as quickly as possible! The top came together very easily, and the part of the directions that I followed was clear. Other mods: no lining (necessary for a dress, not for a shirt), so I just catchstitched the armholes. Even as I was sewing it, I didn’t think it would get much wear, but now I’m rethinking that 🙂 It’s nice and flowy and work-appropriate…and fast! It came together completely during the two-part Masterpiece Theater version of Jane Eyre. I’m relieved that Butterick patterns seem to fit me…previous experiments with Simplicity have failed, although I am getting much better at making alterations to the shoulder/ armscye/ bust area and am about to set to work on a vintage Simplicity blouse. I made it extra long in the front because I like my tops to tuck in nicely and it’s a cute, blousey look. I had planned to tell you that this passed the “Would you wear it?” test, but not the “Would you buy it?” test, but that is untrue. I’m actually wearing it today and have already been told by a colleague that she couldn’t stop looking at me because I looked so radiant in my top! Yay! How wonderful that feels. In the pattern, the casing is flat and lies underneath of the main body piece, but I chose to ruffle it up and put it on display. The fabric is a poly chiffon from Winmil. Y’all know I don’t like to use synthetic fabrics, but I loved how spring-y this one was–and it was unbeatable at $5 a yard, and I already had thread that matched, etc. etc. Serendipity. There’s not much else to say about it! Sorry for the relatively boring post, but it was such a quick sew!